The camping facilities near Tryfan were basic but who could complain at the low per night cost. It had rained for most of the Friday but luckily the clouds parted in the evening to allow us to pitch the tents in the dry. Saturday was given a good weather forecast though low cloud surrounded most of the mountains Tryfan and the Glyders. Ken Fyles and Helder Machado set off for "Amphitheater Buttress" on Craig yr Isfa in the Carneddau. Helder had been looking forward to climbing this route ever since he learnt it was 1000ft long and, at V. Diff, could be climbed in big boots. We tried to persuade John Garbutt and his 15 year old son Kit to join us but John wisely chose to go to Tryfan East Face to climb the easier access route of "Second Pinnacle Rib". 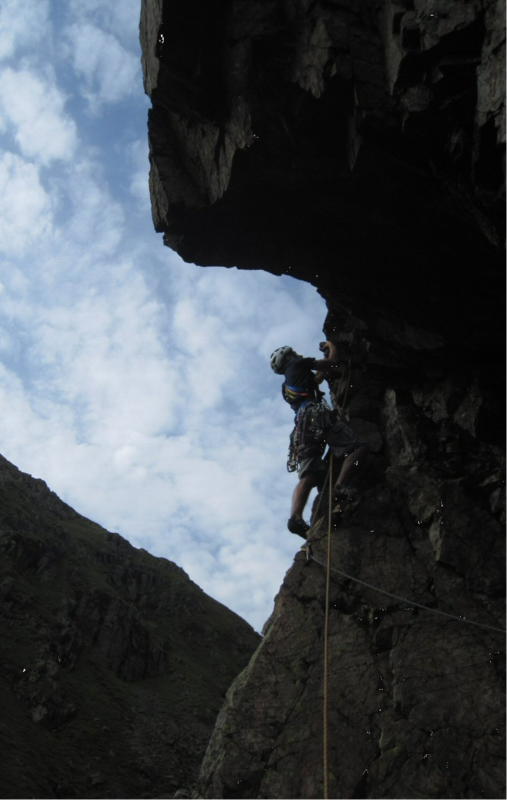 Whilst on this route they met the third climbing team of Chris Mannesseh and Jeff Dodwell where their route met "First Pinnacle Rib" near the notorious 'Yellow Slab' . Several days of dry weather and the scene seemed set fair for rock climbing. But Oh NO, the high pressure was due to collapse on the Saturday. 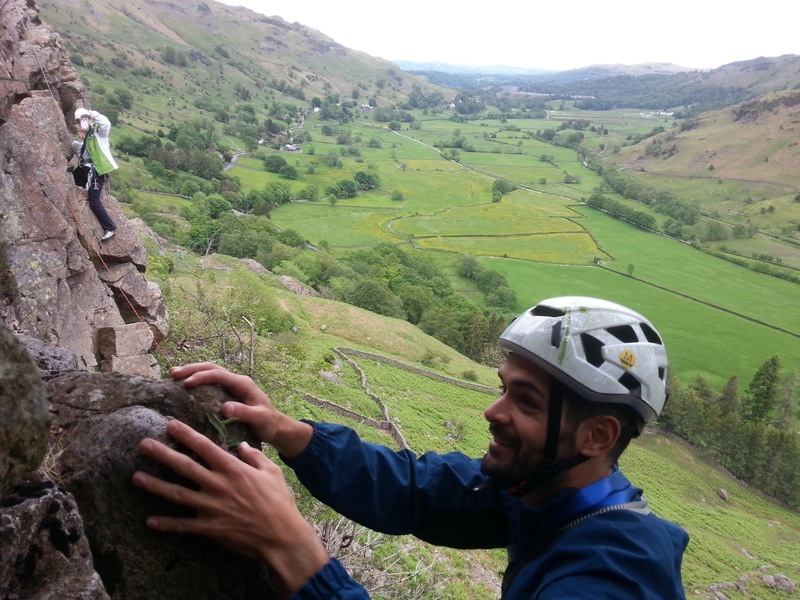 Ken Fyles and Helder Machado decided to take no chances and headed off to Langdale on the Friday morning. Arriving Langdale at noon they headed straight off to White Ghyll to climb two highly recommended routes, "White Ghyll Wall - VS" and "Slip Not - VS". Ken wanted to climb White Ghyll Wall because he had gone 'off route' whilst attempting it the previous year. The notorious 2nd pitch was every bit as awkward as he remembered but it was Helder's turn to lead the 3rd pitch around the nose from the belay. This is given as only 4b but Ken was finding it every bit as hard as the 4c second pitch. "Slip Not" is always a glorious climb to do. The 1st pitch is delightful, interesting and well protected all the way to the roof. What a contrast for the second pitch - a crawl along a ledge then a stride of faith onto the opposing corner wall with a minimum of protection. This was Helder's lead and it is always a relief to round the corner and get the first bit of good protection. Good steady climbing lead to the top. Later on Friday evening, Alice Mason, Malcolm Brentford and Simon Chriscoli arrived. 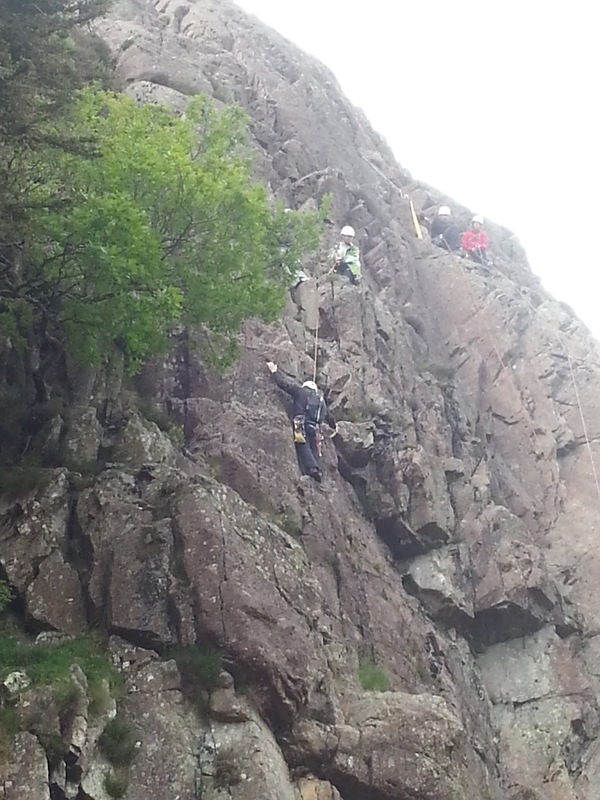 As expected, the weather turned on Saturday but it still seemed dry for rock-climbing. The St. Helens crew set off for the nearest crag, "Upper Scout". All the climbs here go at about VD but protection is sometimes tricky to find. Just as we'd finished our first routes, the rain came in. 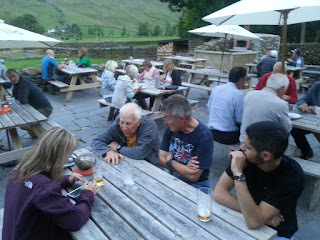 Malcolm, Ken, Alice and Helder enjoying a pint. Off we went back to the hut and prepared to use the rest of the day for scrambling. Up the Dungeon Ghyll Path to "Thorn Crag" where there is a lovely scramble with a small ruin at its foot. As we approached rain seemed to threaten but this scramble goes in the damp. In improving weather we scrambled over the Langdale Pikes to Pike o' Stickle then descended to begin another big scramble up Harrison Stickle south east face. The hut the route finding on this scramble was a little tricky but joined by three other people from the hut we sorted out the easy way to the summit. All that remained now was a descent to the valley by Stickle tarn and a well deserved pint at the pub. Members of the Wayfarers’ and Merseyside Clubs set their sites on Bowfell. 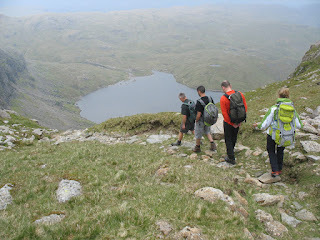 Some continued to Scafell whilst others turned to the Crinkles. 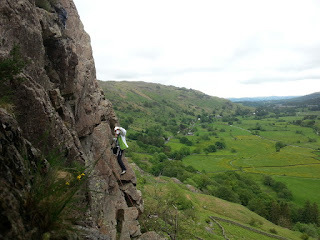 Others climbed on Raven Crag. It rained heavily in the night and on the Sunday morning the weather still looked unsettled. Again the St. Helens crew set off for Scout Crag. Helder and Simon climbed 'Route 2' and 'Zero Route' both of which they described as excellent. Meanwhile Ken lead Malcom and Alice up the popular "Route 1". Alice was feeling in fine form and wanted to lead the four pitch "route 2". This route has some tricky moves but adequate protection. Just as we arrived at the top the rain came down. Aquick descent to the hut and an early start home ended the weekend.